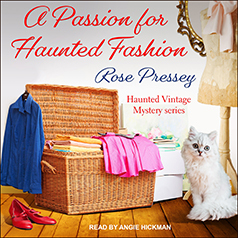 Rose Pressey presents Book 6 in a Haunted Vintage Mystery series. When Cookie Chanel moonlights as a costume designer for a local theater, murder takes center stage . . .
Folks say the Sugar Creek Theater is haunted. But that doesn't scare off Cookie Chanel, owner of Georgia's chicest vintage clothing store, It's Vintage Y'All—especially since Cookie talks to the ghost of her grandmother every day through her cat Wind Song. Still, after she agrees to be in charge of costumes for a production of Cat on a Hot Tin Roof, she's surprised to find the specter of a young woman in the theater, keeping watch over a trunk of 1950's dresses. And when Cookie's best friend Heather is found standing over a stabbed actor, she has two mysteries to solve. This is not a dress rehearsal. A desperate killer is waiting in the wings. If Cookie doesn't tread the boards lightly, it'll be curtains for her as well . . .